How do you follow up one of the most beloved animated features of the modern age? That was a problem faced by the crew at Pixar Animation Studios in 1995 after their Toy Story thrilled and delighted audiences of all ages. 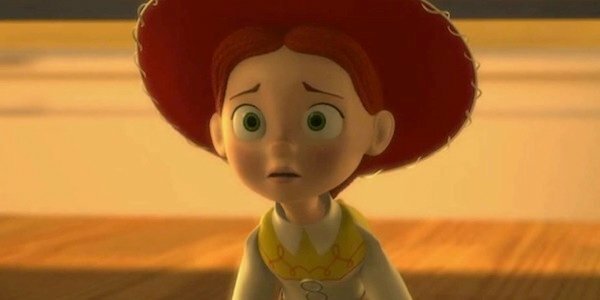 While developing Toy Story 2, they ran into issues with the story becoming too predictable. It was a problem they circled around, but ultimately it was one new character, Jessie, who saved the day. She had been the darling of a little girl, but the girl grew up and discarded her. The reality is kids do grow up, life does change, and sometimes you have to move on. Since the audience members know the truth of this, they can see that Woody has a real choice, and this is what grabs them. Through Jessie and her story, the creative team, including director John Lasseter and writer Andrew Stanton among others, was able to show a different perspective on the situation. This is Disney and Pixar we’re talking about (okay, we didn’t know Pixar quite as well back then as they only had Toy Story and A Bug’s Life under their belts), so we didn’t really think that Woody was going to choose to abandon Andy, but thanks to this new element the possibility there. It was actually a plausible outcome, to the point that it added tension and drama to Toy Story 2 where it had been absent before. This wasn’t as easy and obvious a choice as it was in earlier incarnations of the script. This element of the fear that the toys have, that they might be discarded and forgotten and outgrown, is something that audiences were able to relate to. And they certainly found a lot to cling to here. Critical reviews praised the film as being as good as, if not better than the original, which is always rare with a sequel. It also made $485 million worldwide, topping the first film by more than $120 million, which is nothing to sneeze at. Upping the stakes like this, making you believe that everything may not work out like you expect, has become Pixar’s MO over the years. It’s visible in just about everything they produce, including Inside Out, which hits theaters this weekend.